Let’s discuss the future of retirement in the United States. 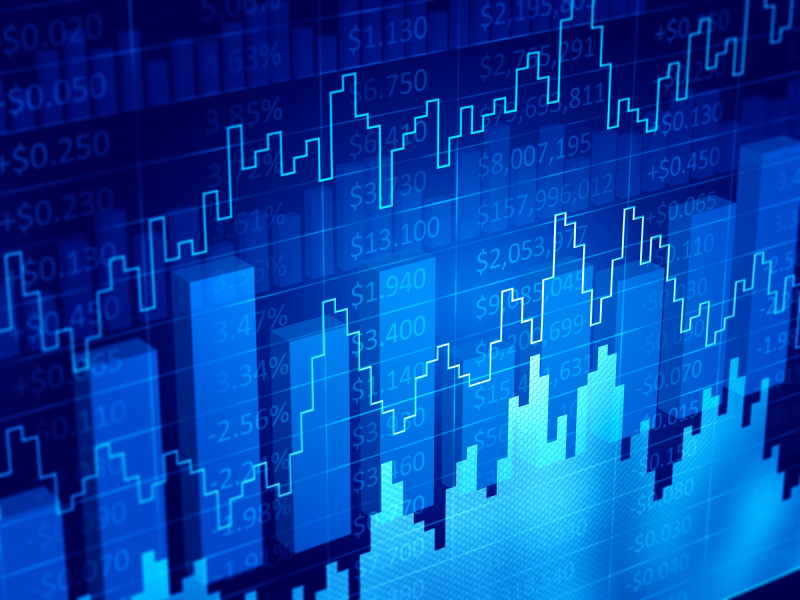 For a few brief decades after Social Security was established, and after World War II, a majority of Americans could look forward to relying on the proverbial “three-legged stool” for retirement income. The three legs included defined benefit private pensions, personal savings, and Social Security. As recently as 1980 some 60 percent of private sector and virtually all public sector employees qualified for a defined benefit pension. When added to their social security, and any savings they had, a generation anticipated the most comfortable retirement in U.S. history. That reality is slipping into the rear view mirror now, and current and future retirees are much more likely to rely for income on just two stools, personal savings (401K, IRA, savings accounts, home equity, etc.) and Social Security. Such is the system that has emerged over the past two to three decades as private pensions become a thing of the past, and defined benefit pensions disappear from the public sector. In short, future American retirees are being counted on to save for themselves, and to live on whatever that savings may be, plus Social Security. So the question is, what does that saving look like right now? This means the median household approaching retirement has a nest egg of between $10,000 and $20,000. This number is drawn down significantly because 41% of these households have no retirement savings whatsoever. 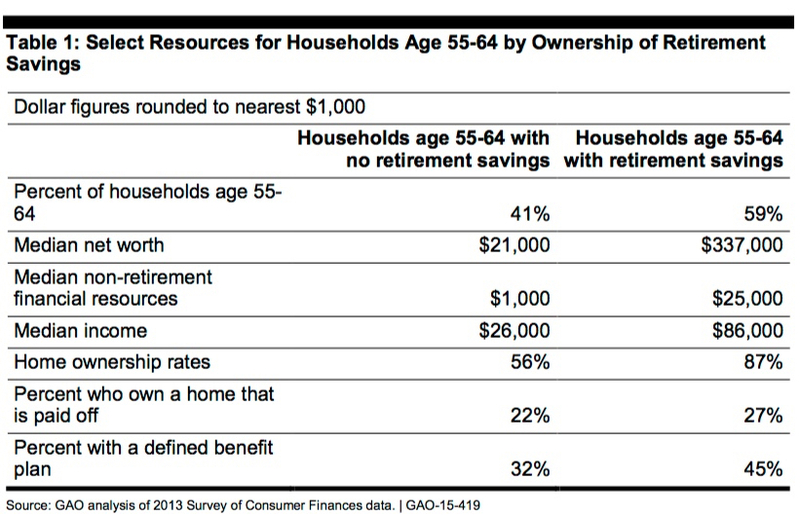 The GAO report points out that people at the low end of the savings spectrum do not necessarily worry or feel they will not have enough, perhaps because of a paid up house, a very modest living style, or whatever. But, it seems to me that once glance at the chart suggests that in an economy where private pensions are literally disappearing and the personal savings expected to replace the pensions lag, we face a likely problem, perhaps even crisis, in the financial well being of the elder generation in the coming decades. It is insufficient to claim that people should just save more in a time of stagnant incomes. Thus we see increasing conversation around proposals to increase social security, something which I think is virtually inevitable in the coming two decades as elder poverty becomes real. A colossal display of apathy. Heaven forbid these lugs actually forgo the flat-screen tv or new cars to throw a few bucks in the bank to live on in the future when they can just pass that responsibility on to someone else. Increasing social security will inevitably raise taxes. Again, the responsible adults will be left paying for the deadbeats. That is a little harsh, I would say. I don’t know your income or work status, but I do know it is monumentally hard for a very large percentage of the working population to pay their bills monthly, and that significant saving is pretty much off the table. We can blithly say, well they should move somewhere cheaper or they should give up their cell phone and live on rice and beans so they can save for retirement. But even as we say the words we know the real world does not work this way. If we want a society not overrun by destitute older people, then as our ancestors did in the 30’s, we have to step up. They created social security. We, in my opinion, need to increase social security and to do that, yes we need to raise taxes – not a terrible burden to lift the social security earnings limit and also, if necessary, increase the rate a tenth of a percent per year for about ten years until you have a percent higher tax. For a stable and secure older society it would be worth it. Remember, finally, that when companies no longer put money into pension programs because in these economic times they cannot afford it (shifting retirement saving responsibility to the employee) we don’t say, “those deadbeat companies aren’t even responsible enough to save for retirement,” instead we say, “who could expect a company to put money into a pension when the economy is like this and they have so many other bills to pay.” So it cuts both ways. Thanks very much for sharing your view.